The Minuteman Bikeway is a Millennium Trail, designated by the White House. Abreviated list of Arlington businesses (food, drug stores, bikeshops). Full List. The roadways around the Minuteman Bikeway offer some of the best bicycling areas in New England. For recommended bike-touring and transportation routes, check out the Massachusetts Bicycle Maps, Boston’s BikeMap, “Pocket Rides” (pocket-sized waterproof maps with illustrated routes), and the "Bicycling Street Smarts" guide — available at area bike shops and bookstores or on the web from Rubel BikeMaps at www.bikemaps.com. For a listing of local bike clubs, many of which offer group rides, see MassBike's website at www.massbike.org/resourcesnew/bike-clubs. Bicycles are vehicles too. Massachusetts state law considers the bicycle a fully legitimate vehicle. Bicyclists have the same rights and responsibilities as motorists when using our public roadways. For community safety, please drive, bicycle, and walk responsibly – and share the road with others. You have transportation choices. To help ease traffic congestion, consider walking, bicycling, or taking public transportation for short-distance destinations. You'll probably enjoy your trip more, and we will have one less car on the road. > Narrow Gauge Rail-Trail (Bedford). Stone-dust trail near the end of the Minuteman Bikeway in Bedford to North Billerica. > Reformatory Branch Rail-Trail (Bedford, Concord). Unpaved trail from the end of the Minuteman Bikeway in Bedford, ending near the historic Old North Bridge in Concord. > Battle Road Trail – Minute Man National Historical Park (Lexington, Lincoln, Concord). Stone-dust trail providing cycling and walking access to the national park's historical and natural resource areas. See www.nps.gov/mima/index.htm. > Fitchburg Cutoff Bike Path. Rail-trail from northwest corner of Alewife MBTA station to Brighton St. near the Cambridge–Belmont border, currently under construction. > Linear Park Path and Somerville Bikeway (Cambridge, Somerville). Paved bikeways from Alewife Station in North Cambridge to Davis Square and beyond in Somerville. Plans are under way to extend this path to Boston. See www.pathfriends.org. > Alewife Connector and MDC Alewife Greenway Paths. These are multi-use, community trails along the Alewife Brook and MDC Alewife Reservation [map]. For more information, see the Friends of the Alewife Brook Area Community Paths website at http://www.pathfriends.org/alewife. > Fresh Pond Paths (Cambridge). Paved 3-mile path around Fresh Pond Reservoir, with dedicated bike path beside Fresh Pond Parkway. > Charles River Bike Paths (Boston, Cambridge, Watertown). 14-mile paved loop traveling alongside both banks of the Charles River from the Museum of Science in Boston to Watertown, passing through the Boston Esplanade. See www.mass.gov/dcr/parks/metroboston/charlesR.htm. > Nashua River Rail-Trail (Ayer, Groton, Pepperell, Dunstable). 11-mile paved trail, featuring spectacular wetlands scenery. See www.mass.gov/dcr/parks/northeast/nash.htm. > Assabet River Rail-Trail. Proposed bike path linking the communities of Marlborough, Hudson, Stow, Maynard, and Acton; much of this trail parallels the Assabet River. (Portions of this bike path are currently being constructed.) See http://www.arrtinc.org/. For a complete listing of bike paths in Massachusetts (both existing and future), see MassBike’s website at www.massbike.org/resourcesnew/pathstrails. See MassBike’s website at www.massbike.org/resourcesnew/pathstrails for a list of future bike paths. For information on the 104-mile Mass Central Rail-Trail, see www.masscentralrailtrail.org. This proposed trail runs from Boston all the way to Northampton! 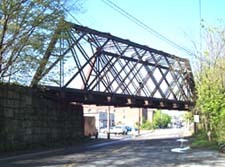 The Mass Central Railroad bridge over Linden Street (Rte 60) in Waltham, Mass. This bridge would be part of the proposed 104-mile Mass Central Rail-Trail. Photo by Craig Della Penna, Rails-to-Trails Conservancy. Click here to learn how you can help get more bike paths and bike routes in Massachusetts.